They have frightened, repulsed and added spice to many movies. Take ten questions on some memorable movie baddies! 1. What was the name of the crazed killer in Dirty Harry? 2. Who was the demented damsel in "Misery" who terrorised her captive writer? 3. How did Voldemort kill Harry Potter's parents? 4. 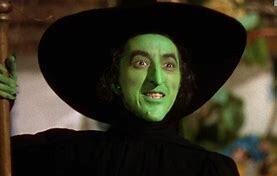 In the "Wizard of Oz" which of the following powers did the Wicked Witch of the West not have? 5. In "Halloween II" how was Michael Myers killed? 6. In "Robin Hood - Prince of Thieves" with what did the Sheriff of Nottingham want to remove Robin's heart? 7. In "Psycho" how many times did Norman Bates stab Marion in the shower? 8. When Luke Skywalker and Darth Vader engage in their sabre fight, what body part does Luke excise from his father? 9. What is Dracula's first name? D. He didn't have one. 10. In "Silence of the Lambs" what did Hannibal Lecter drink while eating a victim's liver?